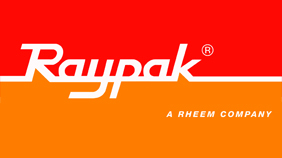 Raypak is a compact and efficient heating design. The Raypak copper tube gas water heaters are high quality, versatile and compact. Their thermal efficiency is 82% while they have Hot Surface Ignition which means they save on operating costs too. Raypak has lightweight ceramic fibre refractory panels and due to the design, it reduces heat loss, thus giving the customer savings. Its compact design means it's also easy to install.